After the Pythagorean crisis with the square root of two, Greek mathematicians tried to avoid working with numbers. Instead, the Greeks used geometry to demonstrate mathematical concepts. A line can be drawn any length, so straight lines became a sort of non-algebraic variable. You can see an example of this in The Pythagorean Proof, where Alexandria Jones represented the sides of her triangle by the letters a and b. These sides may be any length. The sizes of the squares will change with the triangle sides, but the relationship is always true for every right triangle. When Euclid wrote, “Let AB be the given finite straight line,” he was saying to let the line segment AB = x. Then he might draw a square with x as a side, making the area of the square . Or he might draw a second line (y) and make a rectangle (area xy). These shapes can be combined to show relationships, as the triangles and squares were combined to demonstrate the Pythagorean Theorem. First, draw any straight line and divide it into three segments. Draw a rectangle using this line for the base. The height of the rectangle is a. When the drawing is done, you can easily see that the area of the three rectangles is the same as the area of the large rectangle . This is always true for any a, b, c, and d.
How might Euclid draw a diagram for ? First draw a square with sides a, which is . Draw lines to cut the sides of the square into two lengths: b and the remainder, . This defines the square . Notice the shaded areas in the diagram. 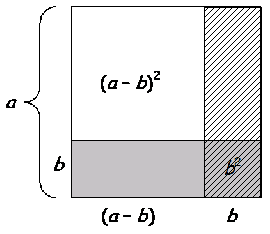 The gray and hatched rectangles are both ab. They overlap each other, and the area of the overlap is . Therefore, to make the square , start with . Cut off and throw away the rectangle ab. Now, you want to throw away another rectangle ab. But to make the second ab, you will first have to add in an extra . Can you draw a diagram to demonstrate these identities? Read all the posts from the May/June 1999 issue of my Mathematical Adventures of Alexandria Jones newsletter. ← If It Ain’t Repeated Addition, What Is It? Thank you for reminding me about that online edition of Euclid’s Elements — I had a lot of fun reading through it and playing with all the interactive demonstrations when I first found it a few years ago. I particularly concentrated on the first book, which I think is one of the most beautiful pieces of mathematics ever. for example, which shows that the volume of a cone is a third the volume of a cylinder with equal base and height.